Another beetle appeared in the garden the day after we had seen one on the side of the car when we were out shopping. Having spotted a fine male in the garden (its the one with fat back legs) females appeared over the following few days and we discovered that it is they who have been chewing on the Osteospermum (Cape Daisy) flowers! 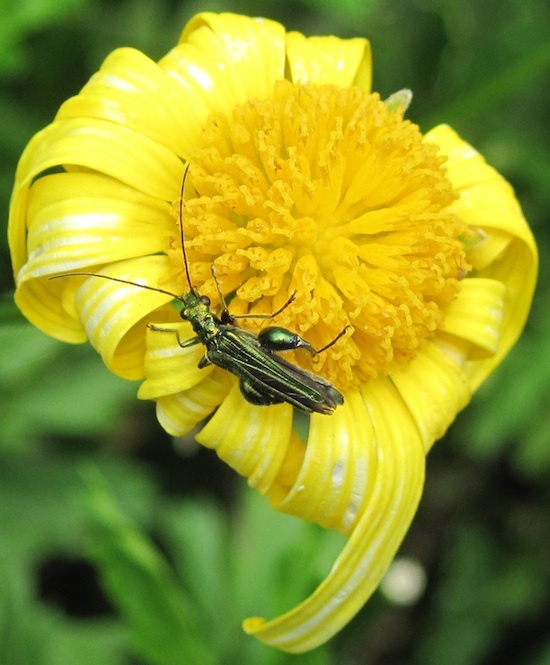 The hungry beetle in question is commonly called the Thick-Legged Flower Beetle (Oedemera nobilis) clearly in tribute to the hansomly thighed males.